Many cities around the globe have placed statues of Jesus Christ, the Virgin Mary or of famous saints on a tall building or on a hill so that they can "protect" their inhabitants. Pope Pius IX had in mind to build a statue portraying St. Peter on the Janiculum, but at its place the Italian Government erected a monument to Giuseppe Garibaldi, who was a fervent atheist. 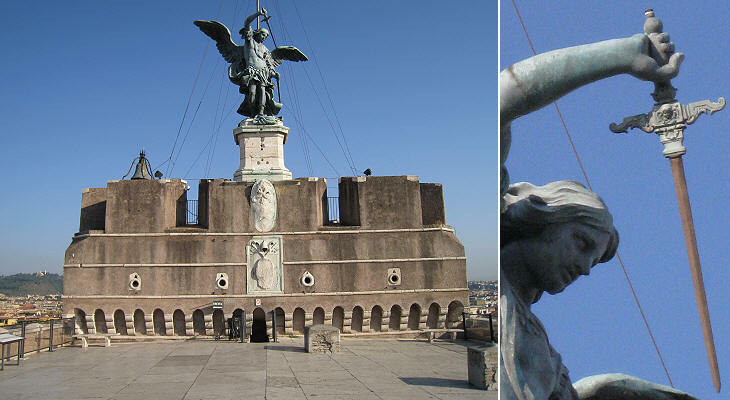 Although in Rome there is no lack of statues positioned at the top of churches, that of the angel at Castel Sant'Angelo is best placed to be regarded as a visible symbol of Rome's Christian beliefs. Rome has a mild climate, yet strong winds can blow from time to time; for this reason the Renaissance marble statue of the angel had metal wings and the Baroque one which replaced it was made up of many bronze interlocking pieces and inside it was strengthened by iron bars. The terrace immediately below the statue offers fine views in three directions (east, south and west); however that southwards is impaired by the sun, unless one goes there in the early morning or in the late afternoon. 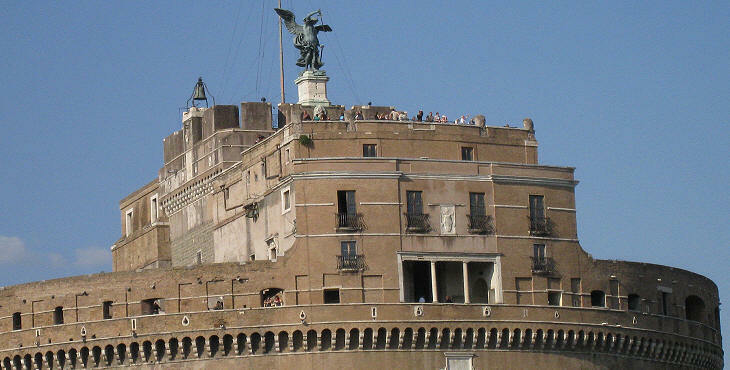 The terrace of Castel Sant'Angelo is not as high as other panoramic points of Rome (see list at the end of the page) yet it is located at the centre of Papal Rome and it allows close range views of its many domes. b) (afternoon) view eastwards from S. Maria del Popolo to Oratorio dei Filippini (15,668x830 image - 2.5MB). Both images are accompanied by a second one which highlights the main monuments and has links to pages showing them.